Southern constellations are those that lie to the south of the celestial equator and are better seen from the southern hemisphere. The southern constellations that were visible to Greeks are mostly associated with Greek myths and some of them even date back to earlier times. The constellations that were not visible to northern observers were not mapped until the late 16th century, when European navigators and explorers started going on expeditions that took them south of the equator. The southern constellations include the entire Bayer family, a group of 11 constellations introduced by the German uranographer Johann Bayer in 1603. These are Apus (the Bird of Paradise), Chamaeleon, Dorado (the Dolphinfish), Grus (the Crane), Hydrus (the Water Snake), Indus (the Indian), Musca (the Fly), Pavo (the Peacock), Phoenix (the Firebird), Tucana (the Toucan) and Volans (the Flying Fish). Bayer acquired these constellations from the Flemish astronomer and cartographer Petrus Plancius, who had based his constellation map on the observations of Dutch navigators in the late 16th century. Constellations in the Lacaille family, introduced by French astronomer Nicolas Louis de Lacaille in 1756, are also all located in the southern celestial hemisphere. These are Antlia (the Air Pump), Caelum (the Chisel), Circinus (the Compass), Fornax (the Furnace), Horologium (the Pendulum Clock), Mensa (Table Mountain), Microscopium (the Microscope), Norma (the Level), Octans (the Octant), Pictor (the Painter’s Easel), Reticulum (the Reticle), Sculptor and Telescopium (the Telescope). Lacaille created these constellations while observing the southern skies from an observatory on Table Mountain in South Africa. They were not visible to ancient civilizations in Europe. 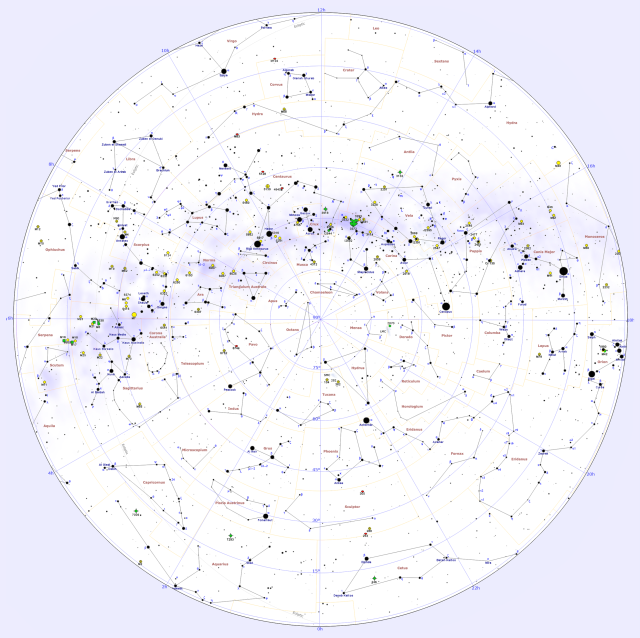 The largest constellations in the southern celestial hemisphere are Hydra (1302.84 square degrees), Virgo (1294.43), Cetus (1231.41), Eridanus (1137.92), Centaurus (1060.42), Aquarius (979.85) and Ophiuchus (948.34). The smallest southern constellations are Crux (68.45 square degrees), Circinus (93.35), Scutum (109.11), Triangulum Australe (109.98), Reticulum (113.94), Caelum (124.87) and Corona Australis (127.70). There are 52 southern constellations in total. They are divided into four quadrants: SQ1, SQ2, SQ3, and SQ4.